Moneda de Oro Águila India AU $10 de año aleatorio Order your Random Year $10 Indian Eagle AU gold coin today and you'll be treated to the lowest price around, from our online store! These incredible pieces, minted between 1907 and 1933, survived the 1934 outlawing of the private ownership of gold in the States, known as the Gold Reserve Act. The obverse feature, designed by Augustus Saint-Gaudens, is a stunningly artful relief of Lady Liberty, in profile, donning a Native American warrior's bonnet with the word, 'Liberty' set in upraised lettering upon the band of the headdress. Also visible on the obverse, 13 stars, representing the 13 original American colonies, as well as the year of issue, which will fall within the mintage period between 1907 and 1933. The reverse of the coin is a vision of equal design mastery: a majestic American Bald Eagle stands alert upon a branch, his every detail realized in dazzling relief. Joining this proud image, the American legend, the coin's denominational value, as well as the slogans, 'In God We Trust' and 'E Pluribus Unum' or 'Out Of Many, One.' 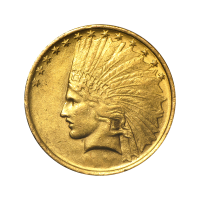 This coin is a proud tribute to the Native American warriors who played such a pivotal role in the unfolding of American history and the coins, as survivors of the Gold Reserve Act of 1934, are truly a piece of history themselves. Own one of these miraculous collectibles and diversify your holdings with a Random Year $10 Indian Eagle AU gold coin today.